In addition to being a working artist and the coordinator for Boston Handmade, I have an arts marketing business called Burko Design. Through my business I work with independent artists and arts organizations to develop marketing campaigns for maximizing industry visibility and assisting creative businesses to reach their professional goals. Since 2002 I have found that working with clients one-on-one is a great way to focus on their individual needs, though I also enjoy leading workshops and engaging in more public forums so that I may have the chance to connect with a wider audience. 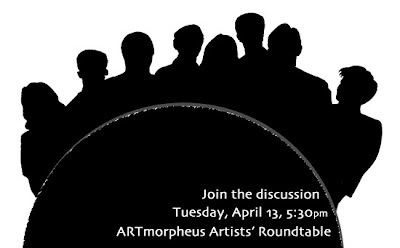 In partnership with the Boston Center for the Arts and ARTmorpheus I will be the featured presenter at The April Artists' Roundtable where everyone is welcome to participate in a conversation about marketing and building community. The Artists' Roundtable is a monthly gathering and forum for peer exchange geared towards artists working in all media to network and share resources with one another. This Tuesday, April 13, from 5:30 to 7:00pm I will be leading a discussion about how artists can reach out to collectors, build a supporter base, and self-promote using new media and social networking. This event will be held at the Mills Gallery at the Boston Center for the Arts located at 551 Tremont Street, Boston, MA 02116. For directions and more information visit the BCA web site.